An interesting homegrown California Central Valley chain, Save Mart began operations in Modesto in 1952. Since then, it has grown to over 100 stores, mostly through acquisitions. In 1960, Save Mart operated 10 locations, mostly near Modesto. Later in the decade, a Fresno presence was established with the purchase of several McMillan’s locations. CEO Bob Piccinini bought out his family members in 1987 and began a bigger period of expansion in the wake of consolidation among other area chains. Save-Mart benefited tremendously from the closings of other chain stores. Several former Albertson’s and Alpha-Beta stores were purchased in the 1980s and operated under the Food Bank banner in Stockton. The struggling California Fry’s stores were acquired in 1989 and continued to operate under that name for several years. This increased the company’s presence in Stockton and also marked its entry into the Bay Area (San Jose, Antioch, and other locations). 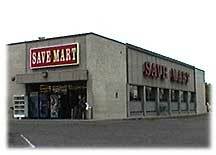 In 1996, Save Mart purchased the three remaining stores in Safeway’s Fresno region, adding to its presence there. And in 1997, ten Lucky stores in Stockton and Modesto were purchased and re-branded. By modern marketing standards, Save-Mart is a bit anachronistic. Its central California stores are a hodgepodge of “outdated” styles from its acquired chains, going back a good 20-25 years. Remodeling has obviously a not been a priority, maybe because the chain is so dominant in its core markets of Fresno, Stockton (where the chain operates as S-mart Foods due to a pre-exisisting Save-Mart chain), and Modesto. Stated company policy is to keep stores open as long as they’re profitable, no matter how small nor how close other Save-Mart stores may be. Save-Mart also operates food processing facilities with the Raley’s group of stores. The company also operates Food Maxx warehouse stores in central and northern California. In 2007, Save-Mart purchased the Bay Area’s remaining Albertsons stores, and restored to them the the Lucky Stores brand under which they had previously operated.